Cashino Slots | Get a £1,000 Welcome Package today! 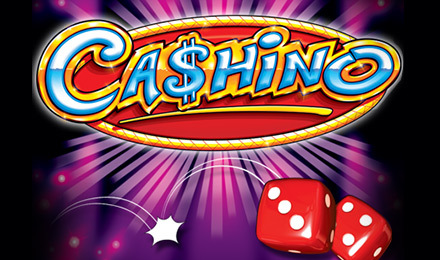 Play Cashino slots and win piles of cash at Moon Games! Play the Cashino Card Bonus, Roulette Wheel Bonus, and Free Spins Bonus for out-of-this-world winning opportunities! Cashino slots is an online slot game with bright and colourful graphics and amazing winning potential! The symbols include various Letter symbols and 3 different types of Scatters! There is also a Wild symbol which not only replaces other symbols but also offers multiplied wins when it appears in a winning payline! 5 Wild symbols will get you an incredible 10,000 time your wager! There are three lucrative Bonus Rounds you can trigger when you play Cashino Slots! If you love playing Roulette you’ll love the Roulette Wheel Bonus game! Spin the wheel for a chance at multiplied winnings! Activate the Cashino Card bonus and the Free Spins Bonus to win even more!